Pet Friendly Big Bear lake cabins are available at Golden Bear Cottages Resort. AAA approved designated Pet Friendly cabins have a fenced pet yard. 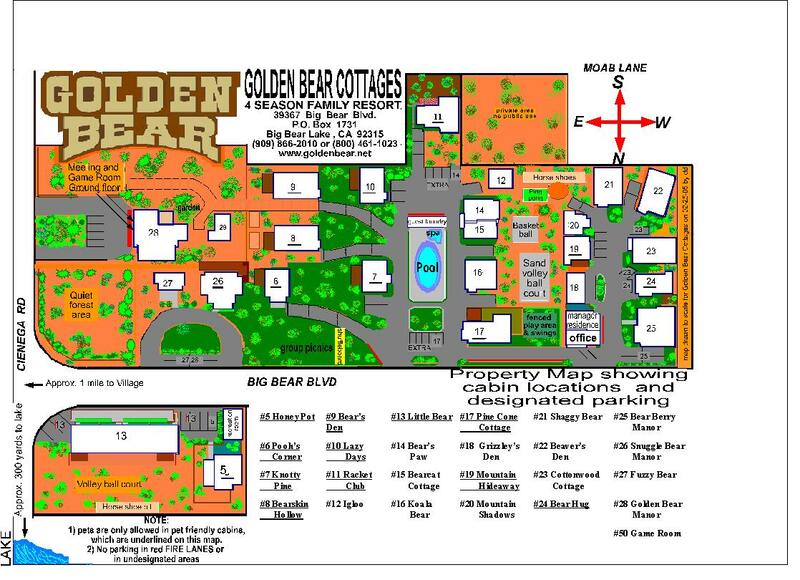 Golden Bear Cottages is your place for lodging and accommodations in Big Bear Lake, California. We have 28 cabins to choose from on a historic five acre resort. 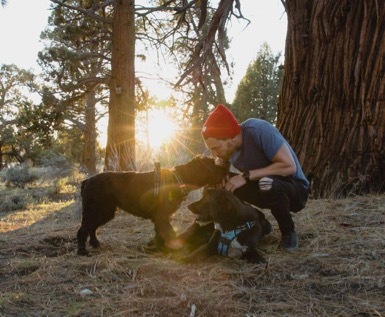 14 cabins are pet friendly and nestled among 200 year old tall pines just a block from Big Bear lake. Choose the best size for your family or group. We are a AAA approved clean historic mountain resort with many size cabins. Our service is friendly and your family pets are welcome. NOTE: If you plan on bringing your pet, make sure you choose a special cabin where pets are welcome. 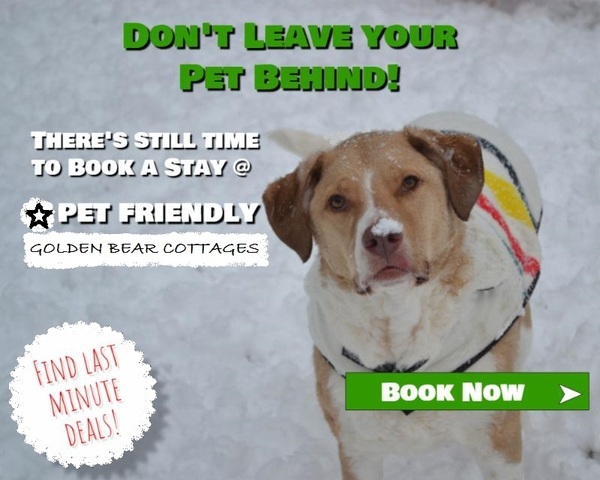 Our very specially appointed Pet Friendly cabins at Golden Bear Cottages all have fenced pet yards (please view the complete list of pet friendly cabins below). More and more pet parents are deciding to bring their pets along when they travel. For many, this means staying at this type of pet friendly accommodation. It's important to make sure that you and your pet are prepared. 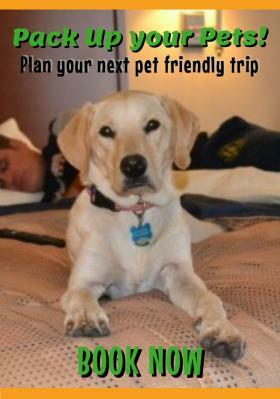 Following some simple tips will help to ensure that your vacation stay with your pet is an enjoyable one....and that you BOTH are welcomed back! It's recommended to book a room on the ground floor and by an exit. This will make it much easier for you to take your pet out for bathroom breaks. Upon check-in, ask the innkeeper or front desk personnel where the designated dog potty area is. Make sure you adhere to their rules of where to let your dog relieve himself. And of course, always bring along poop bags and clean-up after your pet. Be sure to exercise your pet. Exercise helps relieves anxiety, thereby making for a more calm pet. Ask hotel personnel about the best places to walk or run your pet. This means covering any furniture and beds that your pet may be allowed on. 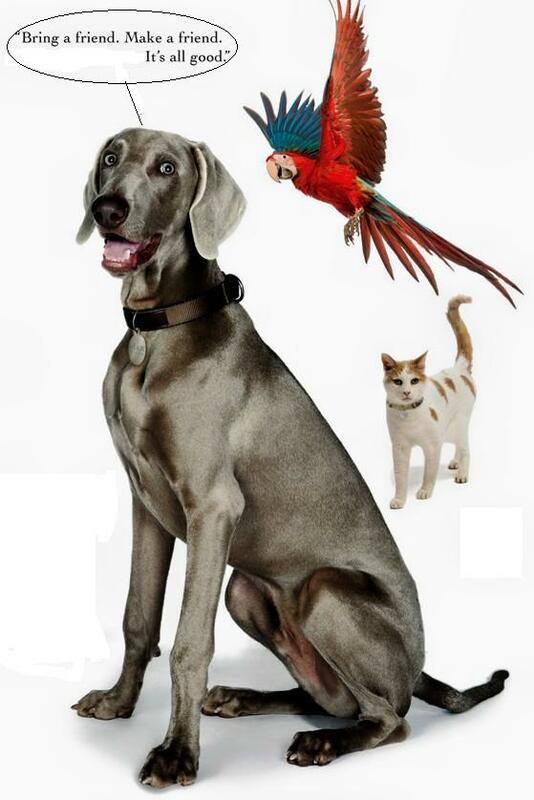 If the pet friendly accommodation does not allow pets on furniture, abide by their rules. If traveling with a cat, place their litter boxes in the bathroom. This will make clean-up much easier. Some pet friendly accommodations will allow you to leave your pet alone in your cabin, but our pet friendly cabins have fenced pet yards too. Our advice is not to leave your pet unattended unless absolutely necessary. Even the best behaved pets can bark and become destructive when in new surroundings. If you must leave your pet alone, be sure that it's for a very short time. Alert the front desk or innkeeper that your pet is alone in the room and try putting on the TV or a radio to make your pet more comfortable. If your pet travels with a crate or kennel, place them in it when leaving the cabin. In addition, place a note on your door indicating that your pet is inside. Before leaving home be sure to give your pet a good cleaning and de-flea & de-tick them. This means a good flea and tick bath along with utilizing preventative flea and tick control. Leaving behind a stinky smell, or worse, fleas or ticks is the kind of thing that makes accommodations change their pet friendly policy. In addition, if a deposit is required, these types of things could very well prevent you from getting it back. 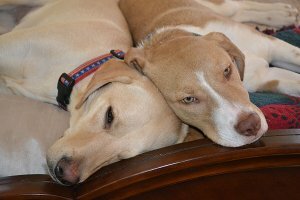 Even pets that have never had an "accident" indoors may do so under stress. Bring along a disinfectant as well as a rag in the event that you have to clean up after your pet. Not doing so could also cause a loss of deposit. Always inform front desk if your pet has an accident so they can follow up. To ensure that you're welcomed back, keep your pet on a leash and avoid taking them into pool areas or other restricted areas.